A bench of Chief Justice Dipak Misra and Justice R F Nariman on Friday referred a petition challenging the Centre’s January 7, 2016 notification and the January 2017 Tamil Nadu amendment to The Prevention of Cruelty to Animals Act allowing the bull-taming sport. A Constitution bench of the Supreme Court will decide whether Jallikattu, the bull-taming sport played in Tamil Nadu as part of Pongal festival, can be given the status of a cultural right and be protected. “After hearing the petitioners and the respondents for some time, we are of the view that these writ petitions need to be authoritatively decided by a Constitution bench of five learned judges, as the writ petitions involve substantial questions relating to the interpretation of the Constitution of India,” the Bench said, formulating five questions for consideration of the Constitution bench. The Central notification and Tamil Nadu’s amendment came in the wake of widespread protests following the apex court order banning the sport on the ground of cruelty to animals. The Constitution bench will also examine if the impugned measures were colourable legislations and perpetuate cruelty to animals. The court had reserved its order in the matter on December 12, 2017. While reserving its order, the court had said the larger bench would decide whether states have the “legislative competence” to make such laws. On November 6, 2017, the apex court sought a response from the Tamil Nadu government on a plea by animal rights body PETA, challenging the state law that allowed the sport in the state. 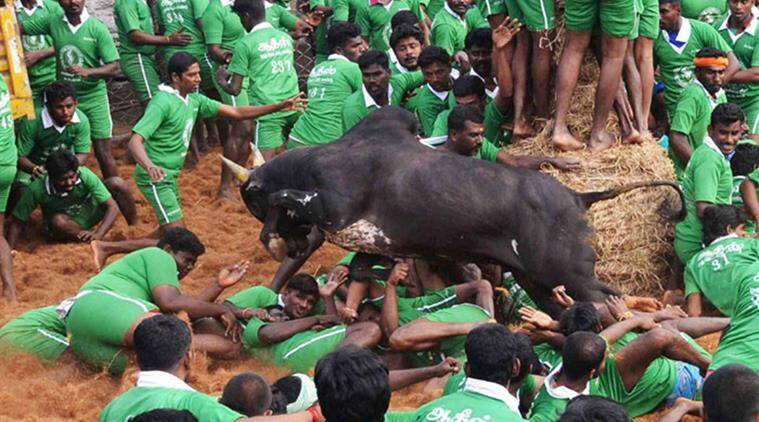 The apex court had earlier dismissed the Tamil Nadu government’s plea seeking a review of the 2014 judgment banning the use of bulls for Jallikattu events in the state and bullock cart races across the country. The court in its 2014 judgement had said bulls cannot be used as performing animals, either for Jallikattu events or bullock cart races in Tamil Nadu, Maharashtra or elsewhere, and had banned their use across the country.